When learning to free motion quilt it can be really difficult to get variety in the designs that are used. Even people with years of quilting experience can be frustrated by a new design when trying to free motion quilt a new project. Luckily, we now have this platform that can bring new ideas and tips to the table for all the quilters out there! Angela Walters has shared a new video that is designed to help with the frustrations that come along while learning to free motion quilt, and while learning new designs. One of the best things about quilting is the variety, it really keeps us on our toes! One of the worst things about quilting is the variety also, because being exposed to a new thing can be difficult. 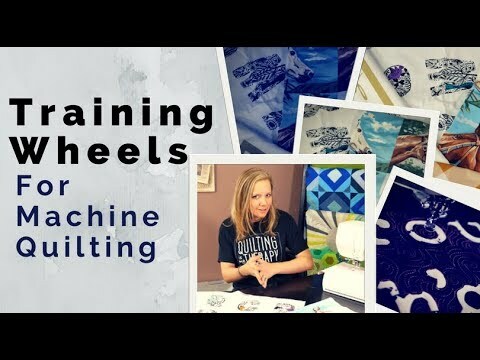 I found that this video has some great tips and tricks on the subject and the title was perfect, “Training Wheels for Machine Quilters…” It is okay to need some help every once in a while! Sometimes the “training wheels” are necessary and extremely helpful. In the video, Angela goes over a few different ways to make free motion easier for us all. Honestly, this can be really tedious, but making it a tad easier brings a new level of fun into it. We all want our work to be everything that it can, whether it is for us or for someone else. This video can be for anyone looking for a boost, but it is extremely beginner friendly. Do not be afraid to jump right in and get going because these tips are excellent boosts! As always, Angela does an amazing job at demonstrating everything technique, and she keeps on her joking and light hearted ways. Don’t forget to check out the video. Good luck with free motion quilting!